America Revealed: Veterans Want You for Civil Resistance! 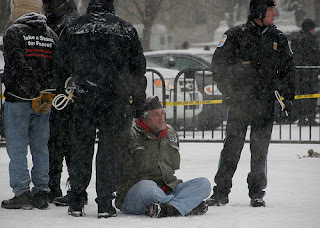 Shortly before his arrest on Thursday outside the White House, famed whistleblower and Marine Corps veteran Daniel Ellsberg, leaned in to speak to Rob Kall of OpEdNews.com. Smiling, Ellsberg declared "This is the first arrest of the rest of our lives." Around him, protesters chanted loudly "Whose house? Our house!" Within an hour, Ellsberg was cuffed and taken away by police. His bare hands, exposed to below-freezing temperatures, formed two peace signs behind his back. This was, according to Ellsberg, his 80th arrest. Mike Ferner, president of Veterans for Peace, said that Thursday's event was an opportunity for a "rebirth and a new boost to the culture of resistance." What does that mean? It means that the arrest of 131 activists, reportedly two-thirds of them veterans, is just the beginning in a wave of civil resistance against the wars in Iraq and Afghanistan and what World Can't Wait director, Debra Sweet, called the "secret wars in Pakistan and Yemen." Earlier in the day, Daniel Ellsberg told the snow-covered crowd of about 500 that it was his belief that the war in Afghanistan would continue unless there was increasing civil resistance against it. After millions of protesters gathered around the globe in February 2003 in an attempt to avert a war of aggression in Iraq, Ellsberg said that he did not blame people for questioning the utility of rallies. He noted "You people have not lost that hope. The civil disobedience has not been tried the way it should have been in the last nine years against the atrocities and the lawbreaking that's been going on." Looking forward, he added, "Let this be the start of a wave of civil disobedience. We will not, just by being here today or by the next action, we won't end this war by ourselves. We can't do that, the people here today. Only the American people can do that. And, if it ends, it will only be because the American people have used their ability to do that." The 79-year-old former military analyst said that President Obama should get the message that, "Yes, you can keep them over there, uselessly dying and killing, endangering us by creating hostility throughout the Muslim world, recruiting for Al Qaeda, giving aid and comfort to Al Qaeda who would like to see us killing Muslim's forever. They can't do better than that when it comes to their recruiting and it endangers us directly. For that purpose we're spending 100 billion dollars a year in Afghanistan." "But," he emphasized, "We can say by being here, no longer does this war go on silently with the appearance of universal consent. We withdraw our consent to carry on this war. You must do it over our bodies." Mike Ferner, who served as a Navy hospital corpsman during the Vietnam War said that he was there to resist because he had seen enough of the "true cost of war to last me a lifetime." Ferner added that the support for the day's action had grown exponentially in recent weeks and that people were planning to be arrested in dozens of cities including San Francisco, Albuquerque, Boston, and New York. Firing up the crowd was March Forward's Michael Prysner. Prysner, who joined the Army at 17, took part in the initial invasion of Iraq. In an earlier report, he explained that he spent 12 months in Iraq doing everything from prisoner interrogations to home raids. He believed that he was going to Iraq to help liberate an oppressed people. He said that he soon realized that his purpose was to be the oppressor and to "clear the way for the U.S. Corporations with no regard for human life." Now, the national director of MarchForward.org, Prysner told OpEdNews "The message is that it is crystal clear that this government is not going to end these wars, the wars that the vast majority of people want to end and the wars that have no purpose other than expanding the reach of Wall Street and oil giants and that is really the main function of US policy." He concluded that "Because this government is incapable of ending these wars and will not end these wars, the people have to stand up and fight to force these wars to end." When asked about the efficacy of such actions, Prysner replied "We don't think we're going to end the war today. We know that. But, these things do make a difference. We're sending a message to the government that we're not waiting for them to spill out more lies about the war and more falsehoods and we're going to stand up and fight and that we're going to disrupt business as usual." Prysner hopes to bring people into the movement as part of a growing force that he believes will be capable of ending the wars. Perhaps even more importantly to this young veteran is his call for more active duty soldiers to refuse the call to participate in the wars. In a voice brimming with passion, Prysner addressed active duty service members, "You have no reason to put your lives on the line and kill and die for profit." Crystal Colon, a former Army sergeant twice-deployed to Iraq agreed. "Civilians in Iraq and Afghanistan are dying on a daily basis," she said. "These wars need to end and the only way we're going to end them is if veterans and soldiers take a stand and say no more. We're not doing this anymore, we're not fighting these wars, we're not dying for political greed or corporations. We're not going to take this anymore and that's pretty much what today is all about is to encourage other people to stand up." "Take a stand," Colon challenged. "Stand up for yourselves and encourage other people to do that." 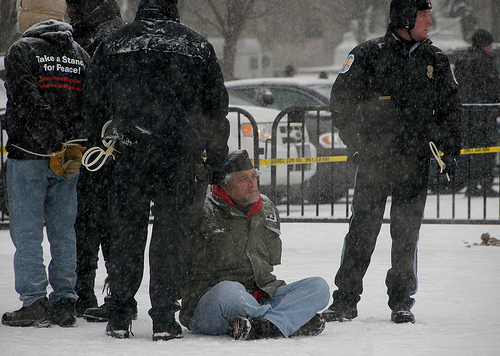 Former Army paratrooper, Elliott Adams, now the nonviolent training coordinator for Veterans for Peace used a bicycle lock around his neck to secure himself to the White House fence. Adams explained, "We're trying to stop these stupid wars. We've been in the wars, we fought the wars and now know they're stupid. They're bad for the nation, they're bad for the people, they're bad for the economy and they are only good for the filthy rich. And, it's time we quit killing people of other nations and killing our own children just to make a few people rich. It's time to stop the wars, stop all the wars. Standing with his back against the White House fence, former CIA analyst and Army intelligence officer Ray McGovern told OEN, "Well, we ain't gonna study war no more. We know what the study of war is, Rob. You know, we've been there, done that." Motioning toward the White House, he charged "These guys don't have a clue," adding "So, we need to put our bodies into it at this point." Before making his way to the White House, McGovern told those gathered in Lafayette Square, "If we don't do activism, democracy is out the door and so we accept our responsibility here. We're going to do all we can to stop the violence being perpetrated in our name and so if the making of peace means prison then that's where you're going to find us."